Me: hey!! do u know that if ur hand is bigger than ur head.. it means u have cancer? Sonic: Great! (sarcastic) You got tricked by her! SHOOT HIM KNUX!! Yes, I'm evil. And mad about Sonic the Hedgehog Art... IS IT A CRIME TO BE PRONE TO ADDICTION?!?! 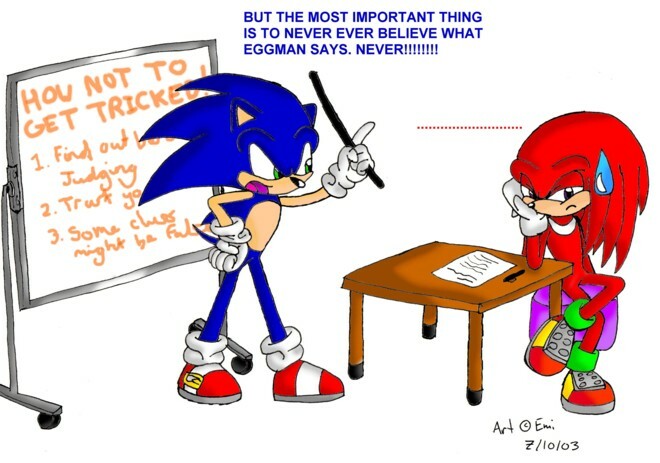 I forgot to say that Sonic should say to Knux "JELLY WORLD DOES NOT EXIST!!" and then they could have a bet on it and when loads of Jelly ppl turn up outta the blue Sonic can say "THAT DOESN'T MEAN ANYTHING!!!!" Disclaimer: Jelly world doesn't exist anymore due to the neglegance of some Owners, who don't feed the neopets on their side account for over a year. The Hungry Neopets ate Jelly World whole. Or was it hungry meepits? Oh, nevermind. JELLY WORLD DOSENT EXIST ANYMORE?????? *Can't hold back laughter, stops laughing* He's been burned!